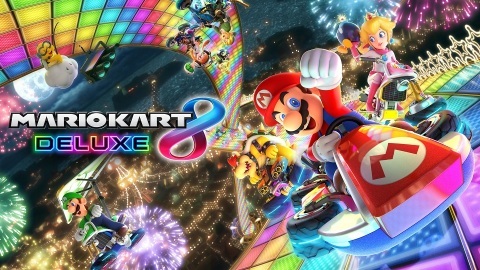 REDMOND, Wash.--(BUSINESS WIRE)--With more than 459,000 combined packaged and digital sales in the U.S. on launch day alone (April 28), Mario Kart 8 Deluxe for the Nintendo Switch system is the fastest-selling game in the long-running Mario Kart series. The previous record holder for the highest first-day sales in the franchise was Mario Kart Wii, with U.S. sales of approximately 433,900 when it launched in 2008. The solid sales numbers for Mario Kart 8 Deluxe equate to an attach rate of 45 percent – meaning nearly one in two Nintendo Switch owners in the U.S. purchased a copy of Mario Kart 8 Deluxe on the first day it was available. To date, more than 2.7 million Nintendo Switch systems have been sold globally. Mario Kart 8 Deluxe has also received more perfect review scores than any other Mario Kart game ever. With a current Metacritic score of 93, the critically acclaimed title is the highest-rated game in the series in 15 years – tying the overall review score of Mario Kart: Super Circuit for Game Boy Advance. To continue this strong momentum into the summer, a series of great games will launch for Nintendo Switch over the next few months, including Minecraft: Nintendo Switch Edition (May 11), Ultra Street Fighter II: The Final Challengers (May 26), ARMS (June 16) and Splatoon 2 (July 21). For more information about Mario Kart 8 Deluxe, visit http://mariokart8.nintendo.com/. For more information about Nintendo Switch, visit http://www.nintendo.com/switch/. Note to editors: Nintendo press materials are available at http://press.nintendo.com, a password-protected site. To obtain a login, please register on the site.